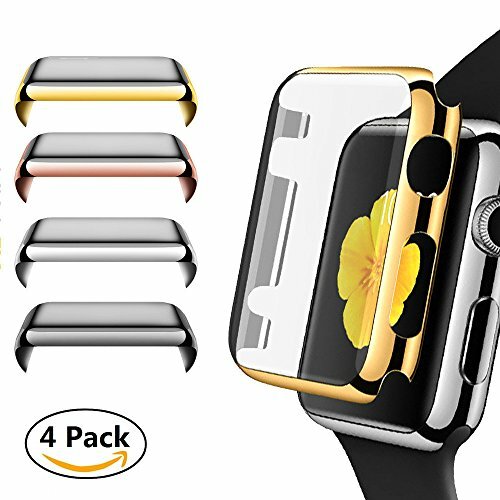 Specifically designed for Apple Watch Apple Watch 38mm Series 3. Make from high quality durable PC material to give excellent protection. Protects your new iwatch against dust, dirt, bumps, scratches and damage. Amazing look and natural feel. Protect against scratches, dust & shocks. 【SPECIAL DESIGN】- Specifically designed for Apple Watch Series 3, Easy access to all buttons and ports without having the case removed. 【360 PROTECTION】- 360°full protection, Covers all sides and all of the screen and Prevents your watch from dust, fingerprints, scratches. 【NATURAL VIEWIN】- 99% high transparency. Reduction natural viewing experience. Amazing look and natural feel! 【ULTRA-THIN】- Lightweight and ultra-thin case fits perfectly around the watch without adding any extra bulk. It is also a classy looking on your wrist. You will get 4Pack case(Black+Silver+Gold+Pink), you can change the color to fit your mood and outfit in daily life.